florist with more than 20 years in the industry. Send flowers to Philippines now! We have same-day flower delivery. Our free flower delivery covers most of Metro Manila. Check our delivery fees and areas. Our professional florists create creative flower bouquets for any occasion. We use imported and unique flower variety as well as locally sourced flowers. Order now! flowers. We also have bundled flowers and gifts at discounted prices. Order now! such as stuffed bears, cakes, wines and more. Flowerdelivery.ph is a flower delivery in the Philippines. 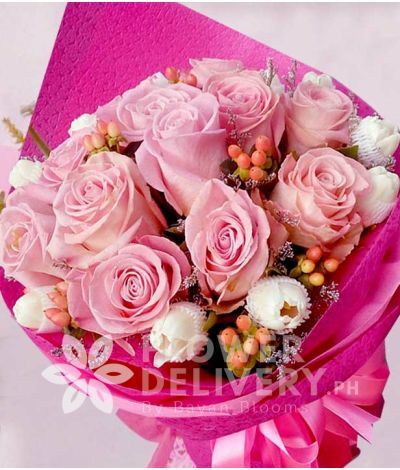 Our online flower shop delivers flowers, flower bouquets, gifts and other flower arrangements within Metro Manila areas such as Manila, Makati, Quezon City and also other nearby provinces. Our flower delivery business headed by Ms. Ednalyn Cruz is composed of professional florists that have decades of experience in the flower arrangement industry. We have a wide variety and resources of different flower blooms and types. We cater to different customers locally and globally who wishes to send beautifully arranged flowers to the Philippines. Our usual customers are composed of foreigners, business owners and love struck individuals who wishes to “make the perfect impression” to name a few. Send flowers to the Philippines. Crafted by experienced florists. Has the lowest flower delivery charge within Metro Manila. We have a large selection of flower arrangements you can choose from. We guarantee that your flowers will be delivered within 24 hours. Have a hassle-free online shopping experience. Guaranteed fresh and professionally arranged flowers delivered at the recipient’s door-step. Thank you for choosing our flower delivery service. Cut-off time for Metro Manila and nearby province same day delivery is 3:00 pm (Philippine Time). Please place your orders as early as possible or before 3:00 pm (Philippine Time). Get your flower delivered today. Check our free delivery areas in Manila. Our office is located in Manila, Philippines. We saw that the flower delivery and arrangement industry lacks high quality arrangements to cater to certain types of individuals. We make our designs accessible to the market with the use of our online store. We design and arrange flowers for different occasions such as birthdays, Valentine’s day, inaugurations, anniversaries, funerals, weddings, father’s day, mother’s day, etc. Our clients could also choose different add-ons and gifts that will go along with our various flower bouquets. We know for a fact that flowers are the perfect gift on most occasions. So what are you waiting for? Make the perfect impression. Do it with FlowerDelivery.ph. The Philippines is located in the equator and is home to hundreds and hundreds of unique and tropical flowers, ranging from dozen species of orchids to – our national flower – sampaguita. The country ..
Orchids was once thought to be one of the most strenuous and complicated flower to grow without any floral experience. But that was before, nowadays people have seen the different kinds of orchids in ..
Did you ever think about the hidden definition of the dozen and countless amounts of Roses you give, or receive, to and / or from your loved ones? Roses are the internationally renowned symbol of love..
What kinds of flowers are deemed worthy of being the trendiest this year? This year will be an outburst of minimalism, seasonality and bright palettes of flowers. Flowers are not just an entity in our.. Flowers are ideal as a gift for any occasion. You can cheer your friend or you can make the day of your friend, relatives, and even your special someone by sending flowers personally or through flower..
Great service. I ordered from the UK, and was kept updated about my order, it arrived on time, and presentation was great. It made my gf very happy. Would definitely recommend! You guys make my floral delivery needs easy and have helped me with important events. Being able to easily purchase for my partner while here I'm here in the US is invaluable! Thank you and keep on being amazing!!! I will continue to utilize you for all of my special occasion needs! Ordered twice and my fiancé loved them. Thank you for making me able to show her how much I love,miss and think of her even if we are long distance! I ordered flowers from the US to be sent to my godmother for her birthday, not realizing I made the order at 1PM Philippine time. I was fully expecting an email saying there would be a delay in delivery (and understandably so) but they were still able to process the order and deliver the flowers on the same day. My godmother was ecstatic and loved her flowers. She said it made her day.